pes'-ti-lens (debher; loimos): Any sudden fatal epidemic is designated by this word, and in its Biblical use it generally indicates that these are divine visitations. The word is most frequently used in the prophetic books, and it occurs 25 times in Jeremiah and Ezekiel, always associated with the sword and famine. In 4 other passages it is combined with noisome or evil beasts, or war. In Am 4:10 this judgment is compared with the plagues of Egypt, and in Hab 3:5 it is a concomitant of the march of God from the Arabian mountain. There is the same judicial character associated with pestilence in Ex 5:3; 9:15; Le 26:25; Nu 14:12; De 28:21; 2Sa 24:21; 1Ch 21:12; Eze 14:19,21. In the dedication prayer of Solomon, a special value is besought for such petitions against pestilence as may be presented toward the temple (2Ch 6:28). Such a deliverance is promised to those who put their trust in God (Ps 91:6). Here the pestilence is called noisome, a shortened form of "annoysome," used in the sense of "hateful" or that which causes trouble or distress. In modern English it has acquired the sense of loathsome. 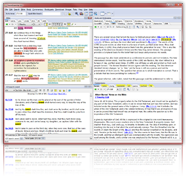 "Noisome" is used by Tyndale where the King James Version and the Revised Version (British and American) have "hurtful" in 1Ti 6:9.Ac 19:8 the King James Version writes "persuading the things" (the Revised Version (British and American) "as to the things") for "present the things persuasively." And in Ga 1:10 (the English Revised Version and the King James Version, not in the American Standard Revised Version) and 2Co 5:11, there is a half-ironic force in the word: Paul's enemies have accused him of using unworthy persuasion in making his conversions. ⇒See a list of verses on PESTILENCE in the Bible. The Latin word pestilentia is connected with pestis, "the plague," but pestilence is used of any visitation and is not the name of any special disease; debher is applied to diseases of cattle and is translated "murrain." In the New Testament pestilence is mentioned in our Lord's eschatological discourse (Mt 24:7 the King James Version; Lu 21:11) coupled with famine. The assonance of loimos and limos in these passages (loimos is omitted in the Revised Version (British and American) passage for Mt) occurs in several classical passages, e.g. Herodotus vii.171. The pestilence is said to walk in darkness (Ps 91:6) on account of its sudden onset out of obscurity not associated with any apparent cause.